How Should Europe Dance with India and China? As Europe lies all but prostrate in the throes of its creeping crisis, the leaders of the continent are reaching out to the emerging economies of India and China for help. No doubt some Europeans greet this spectacle with a shot of nausea. After all, most of us old enough to remember disco can remember a time when it was the other way ’round. What is fascinating here is not the prescriptions themselves, which seem the epitome of level-headed common sense. Instead, what captures the attention is the fact that Dr. von Muenchow-Pohl felt it necessary to give this pep-talk in the first place. As a lifelong diplomat he surely has insights into how Europe’s leaders conduct themselves behind closed doors, and how they frame their negotiation strategies. The meta-message here is that Europe needs to stop being the supplicant, get some backbone, and deal with China and India in confidence. 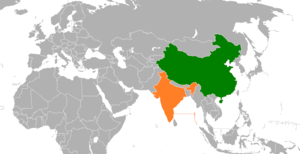 It won’t be easy: the Asians seem to hold all the cards, and they are surely relishing both their new-found stations and the irony of the role-reversal. But it would do Europe and the world no good to have China and India believe the Old World is weaker than is the case, any more than it would serve to have China and India overestimate what they have to offer. This entry was posted in Asia, Europe, International Relations. Bookmark the permalink.